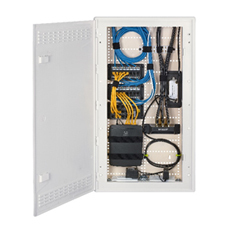 Hubbell Premise Wiring’s new Non-Metallic netSELECT™ Residential Networking Enclosures are designed to be WIFI transparent while providing customers a flexible system that supports emerging residential technology trends in an aesthetically pleasing package. The number of networked connected devices continues to grow rapidity within the home. Many of these devices utilize wireless networking to integrate with the home network. To support this Hubbell’s new netSELECT networking enclosure are manufactured from a high impact thermoplastic that virtually eliminates the signal attenuation associated with traditional metal residential enclosures. These new enclosures are designed to fit inside sixteen-inch stud bays or surface mount and come in 14”, 28”, and 42” high capacities. Aesthetically Pleasing Hinged Door: The door incorporates ventilation, a trim ring, a lock knock-out, and easy to operate spring loaded latches. The 14” and 28” versions are also compatible with the metal netSELECT bases for markets where plastic is not allowed inside walls. High Density KO pattern: The revised KO pattern supports direct piping to individual outlets, provides fiber feed capability, secure feed-though, and dual power outlets. Upgraded Equipment Mounting Hole Pattern: The hole pattern in the enclosure base accepts toolless locking push pins. The new pattern provides additional rows of holes to provide more flexibility in positioning equipment horizontally and vertically. High Impact Thermoplastic Construction: In addition to maximizing WIFI transmission, these enclosures eliminate the potential denting as well as paint scratches and chips common with metal enclosures. Hubbell Premise Wiring is a division of Hubbell Incorporated, an international manufacturer of quality electrical and electronic products for a broad range of non-residential and residential construction, industrial and utility applications. Hubbell Premise Wiring offers a wide array of copper, fiber, audio/video, delivery, cable management and enclosures for healthcare, education, government and data center markets.